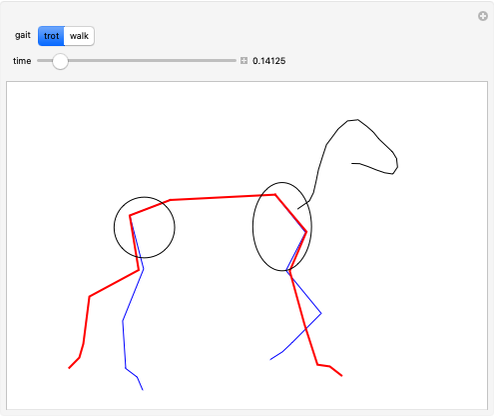 This Demonstration models the leg and torso motion of a walking or trotting horse, based upon measured fore and hind limb joint rotation angles. These joint rotations are used to locomote an anthropomorphically scaled segmented linked motion model. 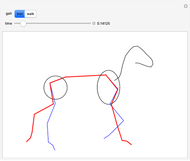 The frame of reference in this Demonstration moves with the horse. You can select the type of gait and the time instant in the cycle. A walk or trot cycle of four steps begins at time 0 and concludes at time 1. The color red is used to indicate the right rear and fore legs and blue is used to indicate the left rear and fore legs. Red is also used for the spine. 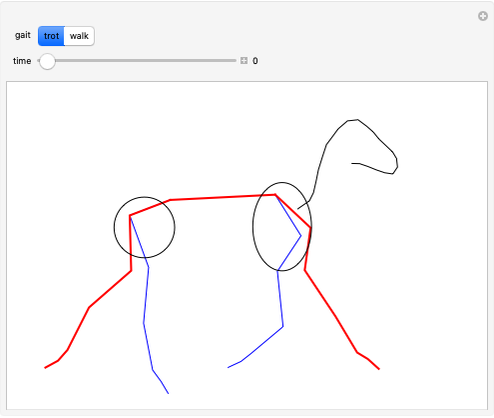 The equine motion model is an extension of the approach to modeling human locomotion in . The joint rotation models are based on . 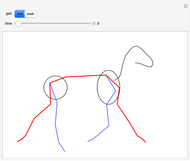 Anthropomorphic data for the horse is adapted from . R. Boulic, N. Thalman, and D. Thalman, "A Global Human Walking Model with Real-Time Kinematic Personification," Visual Computer, 6, 1990 pp. 344–358. W. Back and H. Clayton, Equine Locomotion, New York: W. B. Saunders, 2001. H. H. F. Buchner, H. H. C. M. Savelberg, H. C. Schamhardt, and A. Barneveld, "Inertial Properties of Dutch Warmblooded Horses," Journal of Biomechanics, 30(6), 1997 pp. 653–658.